Letters — What a happy family you seem to be! at the Hare Krsna temple in Seattle. Govindam adi-purusam tam aham bhajami. Our program is to worship Govinda, the original person, with love and devotion. This is Krsna consciousness. We are teaching people to love Krsna. That’s all. Our program is to direct your love toward the proper place. Everyone wants to love, but they’re being frustrated because their love is being misplaced. People do not understand where to place their love. First of all you love your body. Then, a little extended, you love your father and mother. Then you love your community, then your country, then the whole human society. And at last you love all living entities. But all this extended love will not give you satisfaction—until you reach the point of loving Krsna. Then you’ll be satisfied. For example, when you throw a stone into a lake, a circle begins expanding. The circle keeps expanding, expanding, expanding … And when the circle touches the shore, it stops. Until the circle reaches the shore of the lake, it must go on increasing. So we have to go on increasing and increasing our love until we love Krsna, the Supreme Personality of Godhead. There are two ways to increase your love. You can practice loving your society, loving your country, loving all humanity, all living entities, and on and on. Or you can directly love Krsna. Then everything is complete. It is so nice. Because Krsna is all-attractive, love for Him includes everything. Why? Because Krsna is the center of everything. In a family, if you love your father, then you love your brothers, your sisters, the servant of your father, the home of your father, the wife of your father (namely, your mother)—everyone. The central point is the father. Similarly, if you love Krsna, then your love will be expanded everywhere. Another example: If you love a tree, you can simply pour water on the root. Then the leaves, the flowers, the branches, the trunk, the twigs—everything—will be nourished. Then your love for the tree will be properly expressed. Similarly, if you love your countrymen, if you want to see that they become educated, advanced economically and mentally and physically, then what do you do? You pay taxes to the government; you don’t hide your income tax. You simply pay taxes to the central government, and your money will be distributed to the education department, to the defense department, to the hygiene department—everywhere. So, this Krsna consciousness movement is very simple. Very simple. Although it was inaugurated five hundred years ago by Lord Caitanya Mahaprabhu, it is very old; it is spoken of in the Vedic scriptures. From the historical point of view, this Krsna consciousness movement has existed at least since Lord Krsna appeared on the surface of this planet five thousand years ago. And later, five hundred years ago. Lord Caitanya expanded the movement. His mission is aradhyo bhagavan, to propagate the worship of Bhagavan, the Supreme Personality of Godhead. Everyone is subordinate to someone else. Everyone wants to be independent; but this is impossible. Nobody is independent; everyone is subordinate. Nobody can say, “I am completely independent.” Can any one of you say that you are independent? Is there anyone who can say this? No. Everyone is subordinate. And when you love someone, you willingly become subordinate. A girl says to a boy, “I want to become your subordinate.” Why? That is our nature. We want to be subordinate, because our nature is to be subordinate. But we do not know to whom we should be subordinate so that we will become completely satisfied. We reject one subordination and accept another subordination. For example, a worker becomes subordinate to his boss because the boss gives him wages, say six hundred dollars monthly. Therefore the worker must worship the boss; the worker must please him. And if the worker finds some better wages in another place, he goes there. But that does not mean he becomes independent. He’s still subordinate. So, Lord Caitanya teaches that since you must be subordinate to somebody, since you must worship somebody, you should worship Krsna. Then you’ll be fully satisfied. Then, tad-dhama vrndavanam. If you want to worship somebody, then worship Krsna, love Krsna. And if you want to worship some place, worship His place, Vrndavana. Everyone wants to love some place—some country or nation. Somebody says, “I love this American land.” Somebody says, “I love this Chinese land.” Somebody says, “I love this Russian tend.” This is nationalism, bhauma-ijya-dhih. A person is naturally inclined to love some material land, generally where he’s born. So Caitanya Mahaprabhu says that because you are inclined to love some person, love Krsna, and because you want to love some land, love Vrndavana. Aradhyo bhagavan vrajesa-tanayas tad-dhama vrndavanam. Krsna was a cowherd boy. With His friends, the other cowherd boys. He used to go with His cows to the pasturing ground for the whole day. (At that time people were satisfied with land and cows. That’s all. That was the means of solving all economic problems. They did not work in big industries; they were not the servants of anyone. They simply took the production from the land and the milk from the cows, and their whole food problem was solved.) So, Krsna used to go to the pasturing ground, and the gopis stayed at home. Krsna was miles away, in the pasturing ground, and the gopis at home were thinking, “Oh, Krsna’s feet are so soft! Now He’s walking on the rough ground, and the particles of stone are pricking His soles. So He must be feeling some pain.” Thinking in this way, the gopis used to cry. Just see. This is love. When Krsna returned they did not ask Him,” My dear Krsna, what have You brought us from Your pasturing ground? What is in Your pocket? Let us see.” No. They were simply thinking of how Krsna could be satisfied. The gopis used to dress themselves very nicely and go before Krsna. While dressing they would think, “Oh, He’ll be happy to see me.” Generally, a boy or a man becomes happy to see his lover or wife nicely dressed. Therefore it is the nature of a woman to dress nicely just to satisfy her husband. If her husband is not at home, then she should not dress nicely. Women dress differently according to their positions, and by seeing a woman’s dress one can immediately understand what she is. One can understand by seeing the dress that she is an unmarried girl, a married girl, a widow, or a prostitute. Dressing is so important. So, we are not going to discuss the social customs of India. We are discussing the loving affairs of Krsna and the gopis. Their relationship was so intimate and so unalloyed that Krsna Himself admitted, “My dear gopis, it is not in My power to repay you for your love.” Krsna is the Supreme Personality of Godhead, yet He became bankrupt—He could not repay His debt to the gopis. So the gopis possessed the highest perfection of love for Krsna. I am describing the mission of Lord Caitanya. He is instructing us that the only lovable object is Krsna, the only lovable land is Vrndavana, and the process of loving Krsna is shown by the vivid example of the gopis. There are different stages of devotees, and the gopis are on the highest platform. And among the gopis, the supreme is Radharani. Therefore, nobody can surpass Radharani’s love for Krsna. Now, to learn this science of loving God, there must be some book, some authoritative literature. Yes, Caitanya Mahaprabhu says, that book is Srimad-Bhagavatam. Srimad-bhagavatam pramanam amalam. Srimad-Bhagavatam is the spotless description of how to love God. There is no better description. From the beginning it teaches how to love God. Those who have studied Srimad-Bhagavatam know that the first verse in the First Canto is janmady asya yatah . . . satyam param dhimahi. In the beginning the author says, “I am offering my unalloyed devotion unto the Supreme, from whom everything has emanated.” So, it is a great description. If you want to learn how to love God, or Krsna, then study Srimad-Bhagavatam. And for understanding Srimad-Bhagavatam, the preliminary study is Bhagavad-gita. Study Bhagavad-gita to understand the real nature or identity of God and yourself, and also to understand your relationship with God, and then when you are a little advanced, when you are fully convinced that Krsna is the only lovable object, then the next book you should study is Srimad-Bhagavatam. Knowledge of Bhagavad-gita As It Is is the entrance examination. Just as students pass their high-school examination and then enter college, so you must pass your “high-school examination” in how to love God by studying Bhagavad-gita As It Is. Then you should study Srimad-Bhagavatam—that is the graduate course. And when you’re still further advanced, on the postgraduate level, you should study Sri Caitanya-caritamrta. So there is no difficulty in learning the science of loving Krsna. The fact is that we have to learn how to love Krsna. The instruction is there and the method is there, and we are trying to serve you as far as possible. We are sending our boys into the streets to invite you, and if you kindly take up this opportunity, then your life will be successful. Prema pumartho mahan. This human form of life is meant for developing love for God. In all other forms of life, we have loved something else—as birds we have loved our nests, as bees we have loved our hives, and so on. There is no necessity of teaching a bird or a bee how to love its offspring, because that is natural. To love your home, to love your country, to love your husband, to love your children, to love your wife, and on and on—all this love is more or less present in the animal kingdom. But that sort of love will not give you happiness. You’ll be frustrated. Because the body is temporary, all these loving affairs are also temporary. And they’re not pure; they are simply a perverted reflection of the pure love existing between you and Krsna. So if you really want peace, if you really want satisfaction, if you don’t want to be confused, then try to love Krsna. Then your life will be successful. The Krsna consciousness movement is not something manufactured to mislead or bluff people. It is the most authorized movement, based on the Vedic literature—Bhagavad-gita, Srimad-Bhagavatam, the Vedanta-sutra, the Puranas—and many, many great saintly persons have adopted the process of Krsna consciousness as the means of attaining perfection. The vivid example is Lord Caitanya. You see that in His picture He is chanting and dancing in ecstasy. So you have to learn this art; then your life will be successful. You don’t have to practice something artificial and speculate and bother your brain and so on. You have the instinct for loving others; it is natural. You are simply misplacing your love, and therefore you are frustrated and confused. So if you don’t want to be confused, if you don’t want to be frustrated, then try to love Krsna. You will feel how you are making progress in peace, in happiness, in everything that you want. Thank you very much. Srila Prabhupada: Yes. Just try to understand what God is. Do you know the definition of God? Guest: Yes, I know Him as love. Srila Prabhupada: Love is not the definition of God. Love is our activity toward God. But there must be some definition of God. Now, some people give a definition of God in the phrase “God is great.” So, the next question is. How do you test someone’s greatness? If you say that a man is very great, there must be some understanding of how to estimate how great he is. So, how do you understand that God is great? One answer is in your Bible, where it is said, “God said, ‘Let there be creation,’ and there was creation.” Here is greatness. He simply said, “Let there be creation,” and there was creation. Therefore one of God’s names is Satya-sankalpa. This word means that whatever He thinks is immediately manifest. Can you do that? Suppose you are a very good carpenter. Can you say, “Let there be a chair,” and at once there will be a chair? Is it possible? No. So, any person who says “I am God” is a rascal. God is great. You cannot compare your powers with God’s; there is no comparison’. But the rascaldom is going on: “Everyone is God. I am God. You are God.” First show the power of God. Then you can say, “I am God.” But what power do we have? We are always dependent. God is great, and we are dependent on Him. Therefore, the natural conclusion is that we have to serve God. This is the whole basis of Krsna consciousness. Also, that service should be done with love. For example, these boys, my disciples, are serving me. Whatever I say, they immediately execute. Why? I am an Indian, a foreigner; two or three years ago I was not known to them, nor were they known to me. Why are they serving me? Out of love. Serving someone means developing love for him. So unless you develop your love for God you cannot serve Him. Wherever you give some service, it is based on love. A mother gives service to her helpless child. Why? Love. Similarly, our life will be perfect when our love is perfect for the perfect Supreme Personality of Godhead. You have to learn this. This is Krsna consciousness. Guest: How and why did we lose our awareness of our true love for Krsna? Srila Prabhupada: Forgetfulness is our nature, because we are very small, minute. For example, I cannot remember exactly what I was doing last night at this time. So forgetfulness is not unnatural for us. But if somebody revives our memory, that is also not unnatural. The object of our love is Krsna, but somehow or other we have forgotten this. Don’t try to trace out the history of when you have forgotten. That is useless labor. Even if you knew, what is the use? You have forgotten Krsna; that is a fact. Now revive your love for Him. 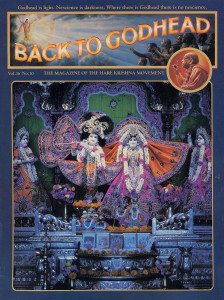 Here is a reminder—this Krsna consciousness movement. Don’t waste your time trying to figure out why you have forgotten Krsna or what the date was when you forgot Him. “Here, take it.” So, now you are all suffering. That is a fact; nobody can deny it. Why are you suffering? Because you have forgotten Krsna. That’s all. So revive your memory of Krsna and become well. It is very simple: chant Hare Krsna, dance, take krsna-prasadam [food offered to Lord Krsna], and hear some philosophy. Even if you are not educated, if you are illiterate, you can hear. You have natural gifts: the ear and the tongue. So you can hear Bhagavad-gita and Srimad-Bhagavatam from persons who are in knowledge, and you can chant Hare Krsna. So there is no impediment. Krsna consciousness does not require any previous qualification. You simply have to use whatever assets you have in the service of Krsna. That’s all. You must make a firm decision: “Yes, I shall take to Krsna consciousness.” That depends on you, because you are minutely independent. 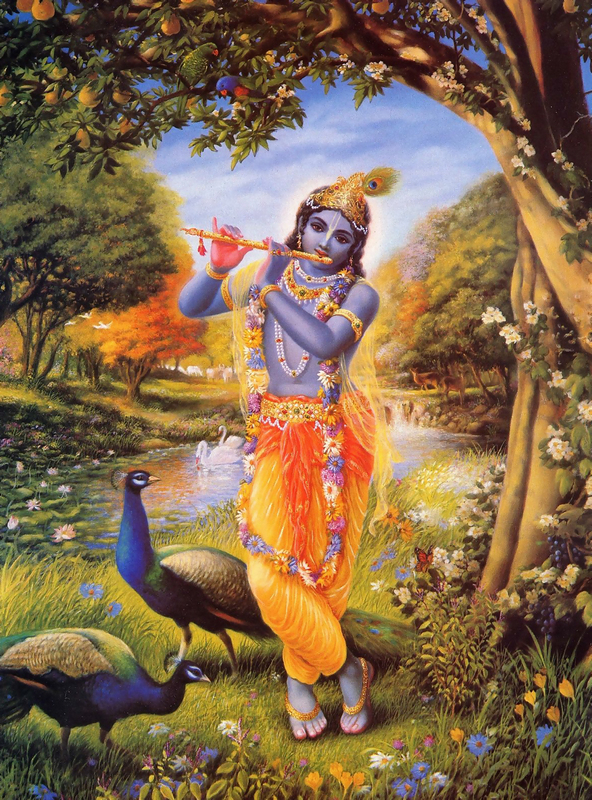 If you disagree—”No, why shall I take to Krsna consciousness?”—nobody can give it to you. But if you agree—oh, it is here. Here it is. Take it.